Splendor Glass Door started as a small glass fabricating company serving the north-west Ohio and south-east Michigan area. When Tom Wanamaker bought the company in 2004, he took the business to a completely new level, growing with the rising trends in shower door and interior glass in the US. “Throughout the 70s, 80s and 90s, shower doors were framed or semi-framed with thin glass. It wasn’t until the early 2000s that the European and Asian style of thicker 3/8 inch or ½ inch unframed glass began to be used as shower doors and for other interior use,” Tom said. In his opinion, the US has always been about 20 years behind Europe when it comes to trends in interior glass. In addition to the unframed, thick glass, a US-specific trend is toward building ever-bigger bathrooms. “So, the demand for larger-sized glass is growing considerably,” he continued. After updating his company’s machinery and strategy in 2010, the business flourished. Tom was able to grow more, expanding into 16 US states with the increasing use of glass in stairways and partitions, in addition to shower doors. “One product that’s getting big now is barn shower doors. That’s a regular barn door that has a bar across with rollers that travels back and forth. So, instead of sliding doors with internal rollers, we’re seeing a huge increase in sliding glass shower doors where we provide both the glass and hardware to glass supply shops that then install the shower doors,” he explained. 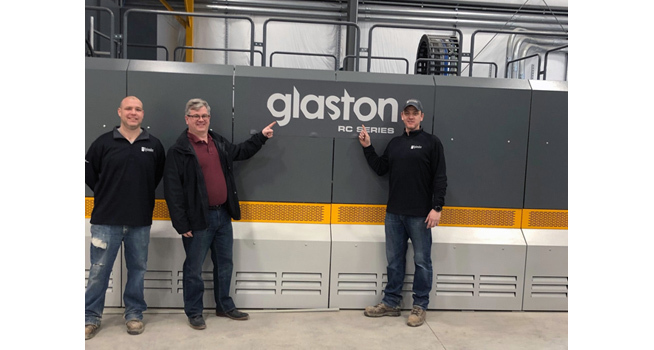 About two years ago, Tom and his team decided it was time to modernize and bring some outsourced processes in-house, such as the ability to temper larger-sized glass with higher quality. In Tom’s opinion, Glaston really knows how to work well with small companies. All the people from Glaston were very responsive and established a good relationship with his employees. He goes on to say that from start to finish, the entire process was easy, productive and stress-free, unlike the experiences they had with some other machinery installed at the same time. According to Tom, tempered glass needs to be of the highest quality. Consumers don’t want to see any blemishes or scratches. The glass must be perfect. “Tempering is the last step in the process – and it’s the hardest. That’s why we feel we now have a highly competitive furnace,” he says. The RC Series will help his company take their quality to the next level, allowing them to temper the larger stairwells and showers that were not possible before. Another feature of Glaston’s tempering furnace that Tom loves is the software. More about RC Series: www.glaston.net/machine/rc-series/. For more information about Glaston: glaston.net.